Back of card: Looks like a close-up of a big green rectangular crystal, as if a close-up of a man's signet ring. Around this is a traditional southwestern Indian border. Relates poorly to the front of the cards. May be inverted. Booklet included: Yes, 64 pages, 2.64 x 4.7 inches, or 66 x 120 mm. Instructions in English, Italian, Spanish, French & German. Comments: Native Americans with what looks like a German expressionist slant (well, something). So, first question, is it legitimate to represent Native Americans be in this fashion? In abstract terms it is of course justified. We can, after all, represent Santa Clause, the Easter Bunny, the Great Pumpkin, even Calvin & Hobbs in any fashion we want. That being so, does such a representation tell us something meaningful about the subject at hand, Native Americans? When the people of the prairie lost their prairies, when the people of the buffalo lost their buffalo - and with them all of the battles - the prophesy of the Kiowa tribe seemed final: The sacred circle of the history of the Native Americans was interrupted. On the snow of Wounded Knee not only were hundreds of warriors killed - an entire world along with its culture, rituals, and faith were defeated. And yet, many years after that night, increasing interest and respect for the Native American civilization leads to the thought that the wound inflicted on the circle at that time is now slowly being healed and that Native American spirituality, on the other hand never assuaged, is back on track. This is flabby stuff. Indians lived in every corner of what eventually became the United States of America. Not just the prairies of the Great Plains. Indians were already on the losing end long before the great buffalo slaughter of the 1880's. 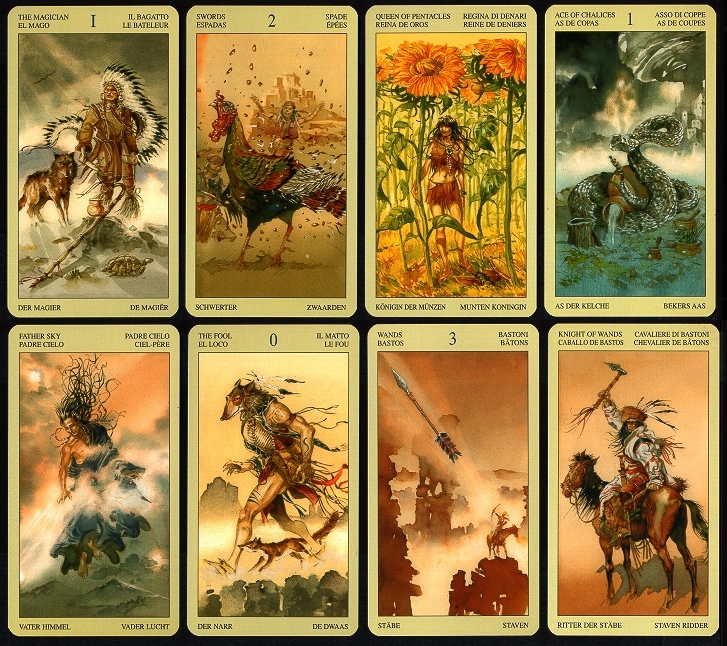 The "sacred circle", mentioned twice, is unrepresented in this deck. The only notable round card in this deck is the Wheel, which looks like a round astrology chart, divided into twelve segments, with a white circle in the center with seven arrows in it. There is a snake at the "ascendant", an eagle at the "4th house", a badger at the "7th house", and a turtle at the "10th" house. The booklet calls this a medicine wheel, but Wiki defines a medicine wheel as a sacred circle of stones on the ground, details lacking in the card. Tourists are sold a round "medicine wheel" made of sticks, usually about 18" (.5 meter) in diameter. These can be, though usually are not, magical implements. Hundreds of "warriors" were not killed at Wounded Knee. On December 29, 1890, hundreds of Lakota, surrounded by 500 well-armed troops of the US 7th Calvary, were in the process of being disarmed. The soldiers were, if what I've heard is correct, not terribly well-disposed towards the natives, who were themselves exhausted & frightened. There was an altercation with a deaf native & when the shooting was finally over, over 300 Lakota men, women & children were dead, versus 25 soldiers. Anyone who has lived in the American Southwest knows the two sides are drifting further apart. Native cultures are, if what I've seen is true, becoming ever more dysfunctional. In New Mexico, Gallup has a reputation for alcohol. Ship Rock has a reputation for serial suicides. This is as grim as it gets. Regret I did not get a lot of meaning from the deck itself.